Acts of artrocities and bloodshed in the Zamboanga siege stunned the world. And the Western Mindanao State University was situated at the core of actions in the crucial month of September 2013 and the days that followed. It was truly a humbling experience for the University to be working with people whose guiding principle is to save lives. Even now the doors of WMSU have remained open to the public. Dr. Milabel Enriquez Ho, the University President, being a nurse understands the need to share the social responsibility to heal the sick and the injured casualties of the insurgency. The Juanito Bruno Gymnasium has been utilized as a satellite emergency hospital of the Zamboanga City Medical Center in collaboration with the Department of Health and the City Health Office. As to date there has been over 2,517 patients admitted on various health conditions. It has temporarily served as a hub of two operating room tents for more than two weeks for minor operation through ASEC Romulo A. Busuego and DOH Regional Directro Nimfa A, Torrizo. Volunteer registered nurses from the College of Nursing provided medical services for evacuees in the same area on a 24/7 basis. The lack of catering services further enthused WMSU to allow the Food Service Center to be utilized as a community kitchen by the International Red Cross and the Department of Social Welfare through the College of Home Economics, the Center for Peace and HANDOG preparing food for over 5,000.00 evacuees. In addition, it also accommodated the request from the Sangguniang Panglungsod to feed over 80,000 evacuees at the Don Joaquin Memorial Sports Complex. The University Student Council with student volunteers actively took the front line in the preparation and distribution of food packs. The College of Social Work and Community Development (DSWD) coordinated with the Department of Social Work and Development in registering profiles of displaced victims and the repacking of goods for distribution to 35 evacuation centers in the City. The College of Asian and Islamic Studies hand in hand with the Gender and Resource Center facilitated the storage of donated items. 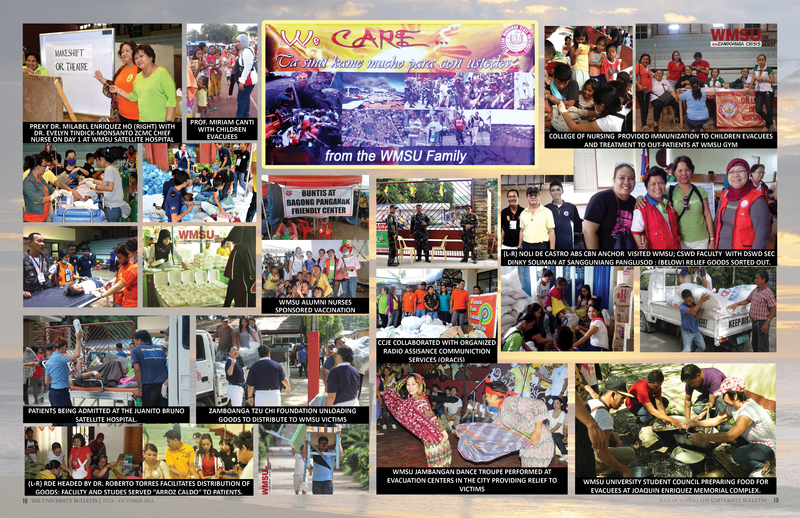 The College of Engineering and Technology together with the Management Information and System Technology worked closely with the DSWD in providing Disaster Assistance Family Access Cards to evacuees or fire victims for identification and database. Stress management and debriefing process have been handled by the Psychology department and faculty of the College of Social Sciences. Some de-stressor activities include the performances of the University Jambangan Dance Troupe held in some of the evacuation centers. The College of Physical Education Recreation and Sports together with the Office of the Culture and Arts took charge of the said activities. The Alumni Office in partnership with the College of Nursing conducted Health Education sessions with evacuees at the Don Joaquin Memorial Complex Grandstand. Institutional initiatives the University undertook included security measures in terms of regular monitoring of the campuses spearheaded by the College of Criminal Justice and the Dean of Architecture. Some administrative personnel continuously operated on a regular basis to ensure that all University transactions are not derailed. In addition, the Public Affairs Office initiated the information and assistance desk for the registration and immediate assistance of WMSU employees and students directly affected by the present armed hostilities.